"Gorgeous Gowns of US Princess"
Following the dispatch two days ago of a tiara valued at a half-million dollars, in the making of which the biggest jewelers of London and Paris collaborated, six girls have started for Athens in charge of twenty-one trunks and fifty-three hat boxes containing the coronation trousseau of the Princess Christopher , formerly Mrs. William B. Leeds of the United States. The trousseau, on which the famous Rue de la Paix dressmakers have been working day and night since it was definitely announced that former King Constantine would return to Greece , includes a sumptuous coronation gown of white satin. The gown is ornamented with purple brocade and has a three-yard train, which is a foot longer than the famous train worn by Mrs. Leeds when she was presented at the British court. At that time she was much criticized, as the court regulations prohibit a train longer than seven feet. This train will be bordered with white seal, which will sweep downward from the head. 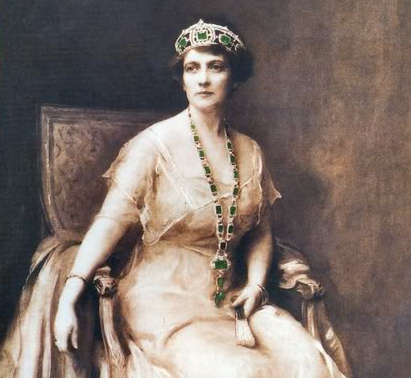 The princess's plumes, mounted with diamonds, will show up in vivid contrast to the famous Leeds pearls, three ropes of which will encircle the neck . 1. 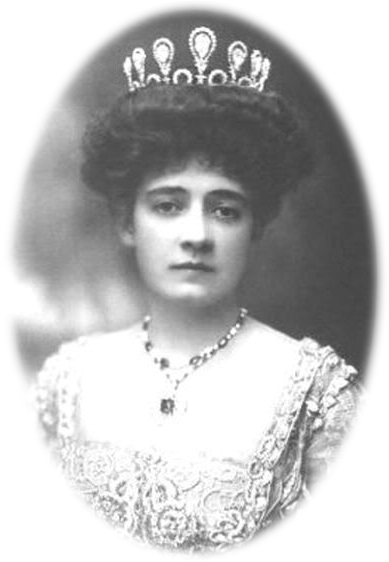 Princess Anastasia of Greece and Denmark (1878-1923), née "Nancy" May Stewart of Zanesville, Ohio. Her first two husbands were both Americans; the second was William B. Leeds, the millionaire tin magnate. After Leeds's death, she was a wealthy young widow on the social scene in Europe -- and one of Cartier's most valuable customers. She became engaged to the much-younger Prince Christopher of Greece and Denmark in 1914, but they didn't marry until 1920 (due mainly to family opposition and global warfare). 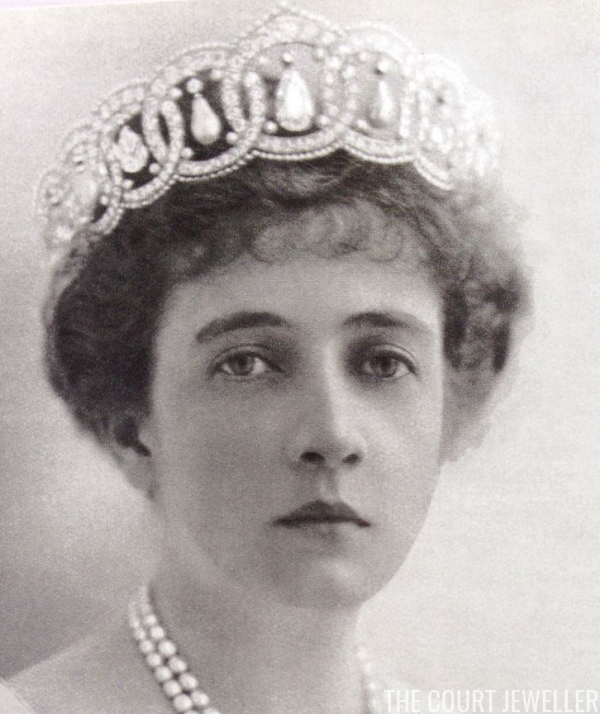 She was created Princess Anastasia of Greece and Denmark, and her fortune helped fund the Greek royal family. Only three years after their wedding, Princess Anastasia died of cancer. Prince Christopher remarried to Princess Françoise of Orléans; the writer and historian Prince Michael of Greece and Denmark is their son. 2. King Constantine I of Greece (1868-1923) reigned twice as monarch of Greece (1913-1917 and 1920-1922). He initially took the throne after the assassination of his father, King George I, and then abdicated under immense government pressure in 1917. He was succeeded by his son, King Alexander, who then died after being bitten by a monkey in October 1920. A plebiscite held afterward restored Constantine to the throne in December 1920, although this article's fanciful thoughts of a majestic coronation appear to be imaginative fictions. Constantine abdicated for a second time after an army revolt in September 1922; this time, his was succeeded by another son, King George II. (George is the one who famously quipped that "the most important tool for a King of Greece is a suitcase.") Constantine died a few months later in exile.